Lorraine enjoys an active musical life as soloist and chamber musician, and has been performing since she was in single digits. Specializing in both modern and Baroque violin, she has twice been soloist with the St. Louis Symphony, performed as soloist/leader of the String Orchestra of the Rockies, in Missoula, Montana, coaches orchestral string technique in area schools, and hosts the Symphony Shuttle, a program of her own design and unique in the symphonic world. On historical violin, she performs with Collegium Vocale and co-founded L’Esprit de Music, Music of the Baroque Era on period instruments, with husband, James Harris. A native of Philadelphia, she began her musical studies at the age of four. 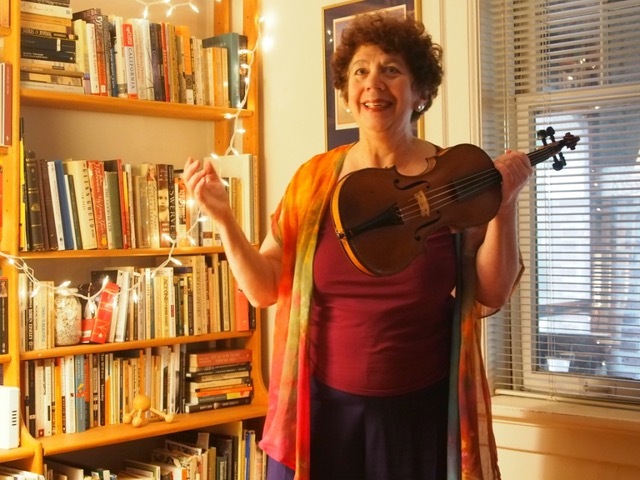 She holds 2 degrees in Violin Performance from Indiana University, in Bloomington, where she studied with Josef Gingold. Lorraine was the 2015 recipient of the Owen Miller Award, given by the Musician’s Union of St Louis, for outstanding musical service to the community. Two blocks south of Delmar and eight houses east of Hanley.